James Starley had developed the Ariel Ordinary in 1871. The name soon fell into disuse as Starley moved to the Coventry Machinists and Swift. With the development of the safety bicycle and pneumatic tyre, Dunlop began building their own bicycles. It has been suggested that there was resistance from other makers to buying Dunlop tyres as it was in effect advertising Dunlop bicycles. Charles Sangster was an opportunist as well as being a good engineer – but he had to get his finances from somewhere. Sangster had been successful at Swift and in 1895 he must have approached Harvey du Cros, jnr. with a business plan for a new factory making components for the cycle trade. Sangster was successful and du Cros backed the creation of Components Limited. The first directors were Sangster and du Cros with Robert Frederick Hall of Hall Manufacturing (makers of Crabbe brakes). Du Cros was already the finance behind Dunlop and Swift. He was also MP for Hastings and a director of Austin cars, Rover, and other motor industry companies. It was almost certainly du Cros who arranged for Sangster to take on the Dunlop cycles, leaving Dunlop to concentrate on rubber. 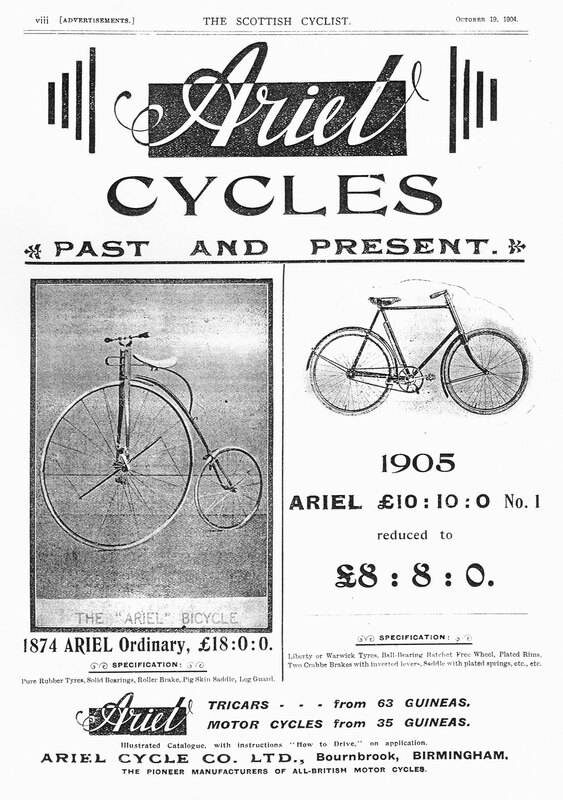 The Ariel name was with Swift and was easily transferred to Components Ltd for their bicycles. I suspect the whole deal was done over a joint of beef and an ale or two at a good hostelry. Ariel in their own early advertising refer to their history dating back to the Starley Ariel, so they recognised the lineal relationship. Despite the fact there was a gap of some twenty years between the Starley Ariels and the Sangster Ariels, it must be remembered that in the early days of Sangster's Ariel the revolutionary Starley Ariel was still well within living memory. 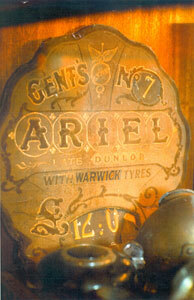 The link between Dunlop and Ariel can clearly be seen in the advertising material from the first years of Ariel. Generally the adverts said "Ariel - late Dunlop" or similar. Even the trade mark was similar, see left.